In the immediate aftermath of last Friday night's heavy home defeat to England, Mike Ross gathered Ireland's women's players and spoke about his own personal experience of being on the end of similar painful hammerings. 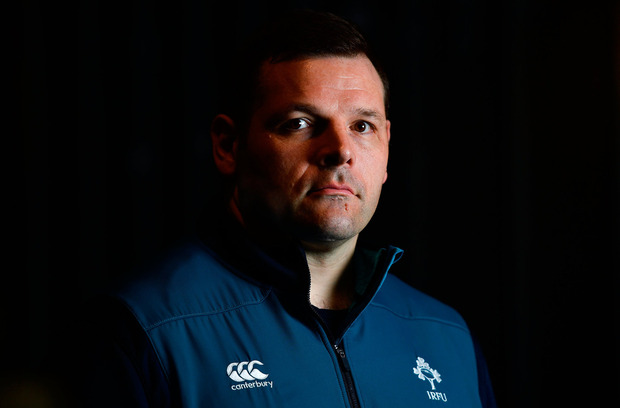 Since becoming Ireland's scrum coach last year, Ross has quietly been building a reputation as an excellent motivator and with disappointed players all around him in the Energia Park dressing-room, he managed to say the right thing at the right time, which by all accounts went down extremely well with the squad. "It did sting because we had really built up towards that game," the former Ireland tighthead who won 61 caps admitted. "We didn't match their physicality. They were offloading out of tackles, which was brilliant at times and that really hurt us. "But at the same time and I said it to the girls afterwards, I was in an Irish side that went down to New Zealand in 2012 and lost 60-0. "Here we are a handful of years alter and we are beating them, so don't get too downhearted about that (defeat). "We are progressing but the other thing is, a lot of the women have under 10 caps. "There was a huge churn in personnel after the last World Cup and we have to try and replace that experience. Sometimes that is going to hurt and sometimes you have to learn on the job. "I mean Sene Naoupu, if you take Ailsa (Hughes) out, she has more caps than the rest of the back-line put together. "It's a harsh environment, international rugby. You are always learning and I think ultimately they will be the better for it." Back when Ross was trying to get his own professional career off the ground, he left Munster for Harlequins in 2006 and it was from there that the Cork native really made his breakthrough. The Ireland women players are now facing a similar reality but Ross is hopeful that will soon change. "Where we are right now, I believe is similar to the men's game in 1995 where we are trying to decide what the future is going to look like," he maintained. "Ultimately, at the start of professionalism, you had a lot of Irish players heading away over to English clubs because there wasn't the same structure in place over here as there is today. "We have to look at that and decide how we are going to structure it because there isn't a structure here to sustain say 60 professional women's players. "But maybe we can do what England have done and get to 15 or 20 or 30 and just keep building that. "We have to aim to really drive the standards up all around and I am seeing that every day." Rúaidhrí O'Connor Andy Friend conceded he was taking a risk by rotating his squad for this European Challenge Cup quarter-final and the Australian learned a harsh lesson at the AJ Bell Stadium.